In response to the 'Great Spectacle' event at the Royal Academy of Arts (12 June-19 August 2018), commemorating 250 years of its Summer Exhibition, Dr Jaron Murphy (Southampton Solent University) has written up interviews with Dr Sarah Victoria Turner, Deputy Director for Research at the Paul Mellon Centre, and Dr Mduduzi Xakaza, Director of the Durban Art Gallery. The interviews are downloadable here. The recent exhibition of Lewis's paintings at Imperial War Museum North attracted a lot of attention in the national press. Excitingly, it also attracted attention from several undergraduate students at the University of Salford. Two review-responses to the exhibition, by Polly Riggs and Noman Mohammad, are now available for download below. Our thanks to Dr Caroline Magennis for sending on these reviews, which impressively attest to the complexity of Lewis's work and to the difficulties involved in presenting it responsibly to different kinds of audience. 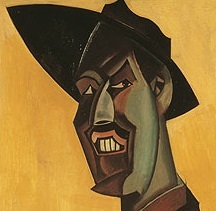 Wyndham Lewis’s quintessentially modernist novel Tarr was published in 1918 (Knopf, USA; Egoist Press, UK). To commemorate the centenary of the novel’s publication, the 2018 volume of JWLS seeks 7,000- to 10,000-word essays reconsidering Tarr’s significance, legacy, and meaning. The Wyndham Lewis Society is saddened to report the death of Walter S. Michel, the pioneering Lewis scholar and author of Wyndham Lewis: Paintings and Drawings (University of California Press, 1971), among other volumes. Walter passed away early in the morning of February 22nd, 2017. A conference devoted to Lewis's work, 'Benign Fiesta: Wyndham Lewis's Texts, Contexts, and Aesthetics', will be held at the University of Nottingham, 11-13 September 2017.